There are two ways to give your AR-15 laser-like accuracy. The first is to equip it with so many actual lasers that it becomes capable of burning holes through distant targets. We estimate that this would take several thousand lasers, which is cost-prohibitive and extremely silly. 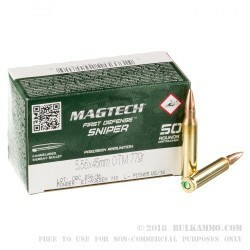 The second way is to invest in a high quality ammunition, exactly like this 5.56x45 cartridge by Magtech. This round’s 77 grain projectile features a boat tail design, the tapered base of which enables it to create drastically less turbulence in its wake in order to amplify its ballistic coefficient. 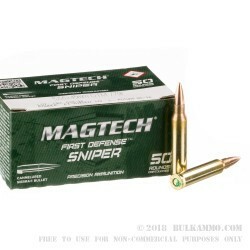 Its hollow point meplat does not make it expand upon impact, but rather serves to immunize it against wind deflection and is exceptionally narrow to enhance its aerodynamic profile. 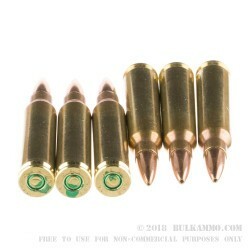 This bullet’s extremely concentric jacket bolsters its rotational stability nicely, and its cannelure helps to prevent setback from occurring. All in all, it’s a true tack driver. 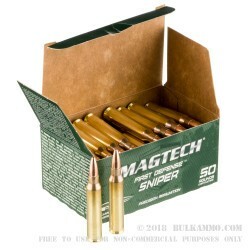 This round’s high quality brass casing presents the perfect opportunity to the passionate handloading enthusiast who’s always after the right medium for his craft. You can count on its propellant and primer to keep your AR-15’s delicate inner workings free from corrosive residues as well.